It’s worth taking time off to prepare this simple, spicy mildly sweet sambar recipe, a prime South Indian staple dish that is served with idli, dosa, vada and hot rice too! Idli Sambar and Vada Sambar are “the most called for combination” for breakfast and evening snacks while Sambar when served with rice slots itself in the category of lunch recipe. Wash dhal, tomatoes and curry leaves separately in water. Drain and keep aside. Boil them in pressure cooker along with turmeric powder, ½ litre of water and a drop of ghee. While dhal is getting cooked…. Wash sambar onions thoroughly in water. Peel the skin and keep aside. Peel the skin of regular onions, chop them (need not be fine) and keep aside. Heat a medium sized kadai. Dry fry the grated dry coconut. Transfer the coconut to a plate. Let it cool. Then grind it along with sambar powder and keep aside. Now the seasoning and sautéing…..
For this, heat oil/ghee in the same kadai. Put mustard seeds. When they crackle put curry leaves and chopped onions (these onions help to bind the sambar well). Saute for 5 min. While sautéing, add salt and a pinch of turmeric. This helps onions to cook faster. Now add sambar onions and continue sautéing till they turn transparent. By now, the contents in the pressure cooker would have cooked well. When the pressure subsides and the cooker cools, open the lid. Peel the skin of tomatoes and mash the tomatoes. Mash dhal also. Let the contents boil. To this, add the fried onions and continue boiling. Mix the ground sambar powder with 100 ml of water in a bowl. Add this to the boiling sambar. Also add salt and tamarind paste. Continue boiling for few more min. Switch off the stove. Did you hear your neighbour expressing envy about the awesome aroma of this spicy sambar? That’s good!…Go, garnish it with thoroughly washed and chopped fresh coriander leaves. Ye…. 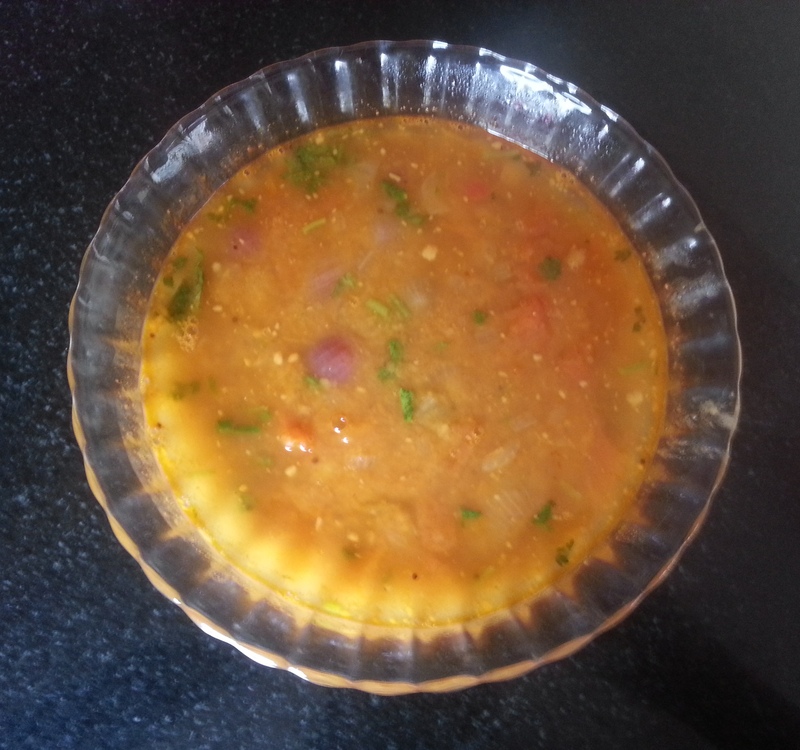 Onion Tomato Sambar is now ready. You can adjust the quantity of tamarind paste depending on the taste of tomatoes. You can’t afford to forget viewing this….”Sambar Powder”…!